Walt’s Café: Hong Kong Disneyland. A Much-Needed Breakfast! Check out my review on Walt’s Café – Hong Kong Disneyland. Visiting a Walt Disney theme park is one of the most enjoyable destinations in the world for families and friends to spend time with one another. If you want to bring back memories from when you were a child and pass them onto your kids then this is definitely the place to visit. For me, I just wanted to feel like a kid again. When my wife and I had the opportunity to visit Hong Kong Disneyland on our flight in to see my in-laws, we just couldn’t pass it up. We wanted to find out if a Walt Disney theme park outside of the USA could be a completely different experience. I had heard about the differences between HK Disneyland and Orlando Disney World such as some Disney characters talked a little differently only because of some translation issues with a slight Chinese accent. Some are the same like the fireworks and electric parade still light up the evening skies. But what I was looking forward to was the food experience. This is Hong Kong, China so I knew that our foodie trek would be quite different. After looking over Disney’s website, we found the Crystal Lotus restaurant inside the resort we were about to stay in. We discovered that we had to make reservations in advance to dine at the restaurant. So just to be safe, we made our booking three months prior. We arrived a little early for our 12pm reservation so we had to wait in the front lobby for only 10 minutes until they opened their doors. We didn’t mind waiting at all so we took our time taking some pictures. I remember telling my wife that I wanted to walk slowly into the dining area. I wanted to take as many pictures as possible so I could just take everything in. I mean the whole space was so grand that you just wanted to stand in one place and turn around 360 degrees and stare at how much effort was put into decorating the restaurant. Beautiful Light Fixture Equally Spaced Out Throughout The Entire Dining Area. When we had made our reservations a few months before, there were a few choices. They offered a la carte Chinese cuisine and other gourmet food but since my wife and I are such big fans of dim sum, we chose their “Special Dim Sum” lunch menu as our Disney dining experience because we were curious to see how they would present the food. When we had called them to inquire about their portions, they explained that the set menu was good for 1 person. After looking at some online photos, we saw there were a few pieces in each dim sum box so we decided to order 3 sets to accommodate our party of 6. After a few moments of sitting at our round table our dishes started to come out. Three dishes of Scallops Salad with Pomelo arrived at our table. After a few bites of this dish we were finished. The portion was small but it had great flavour since it was sprinkled with a light taste of a vinaigrette dressing. Then the soup arrived and what I really liked about this soup was that it was simple. It fused both seafood and tofu together really nicely. Nothing better than chewing into pieces of crab with every bite! Braised Crab Meat, Bean Curd And Crab Roe Soup. What’s really cute and unique about eating at a Disney restaurant is that they shape as many pieces of food to a Disney theme as close as possible such as the next dish below. It’s absolutely crazy how the carrots are shaped like “Mickey’s head” and the zucchinis are “Mickey’s hands”. Wok-fried Shrimps And Disney Root Vegetables. Our next dish was the sesame chicken with lemon juice. Lightly breaded chicken with a tangy lemon syrup is probably close to a “Sweet and Sour Chicken”. This is a common dish with Chinese food and it felt close to home having this as part of my meal. Crispy Sesame Chicken Served With Lemon Juice. The waiter brought out a few dishes of a rice topping of abalone with a small garnish on the side. Rice perfectly shaped in a cylinder topped with a well-cooked piece of abalone. This was only my second time having abalone and luckily both were cooked very well. It’s slightly chewy but the sauce that it is cooked in brings out the seafood flavour. It might be an oversized snail but it was really good! Then the Signature Dim Sum came out. Let me tell you how impressed I was with the amount of detail and work put into each dish. As soon as each dim sum was placed in front of us, we all couldn’t help ourselves taking photos with our smartphones. Each dim sum dish had its own unique flavour. They were all cooked just right inside and out. None of them were undercooked/overcooked. But what I want you to see is the time and effort put into each dumpling and pancake. The choice of colours to create each character. The small shape of the pig’s nose and ears. The little antennae on top of the little green men’s heads. This sort of detail made our eyes lit up because it was so well made with such intimate detailing that it really brought out the Disney kids within us. When Duffy the Disney Bear dim sum arrived, we were still impressed. Some of you remember the preview I showed a couple days ago. Well one serving actually came out on a single steamer tray with two small pieces of pudding. Look how absolutely cute and adorable Duffy is! Look closer at one of the puddings: One of them is shaped like Mickey’s hand! The final dim sum tray we had to order when they offered it to us at the table. It was an additional fee on top of our set menu but we didn’t care because we wanted to see for ourselves what it was. 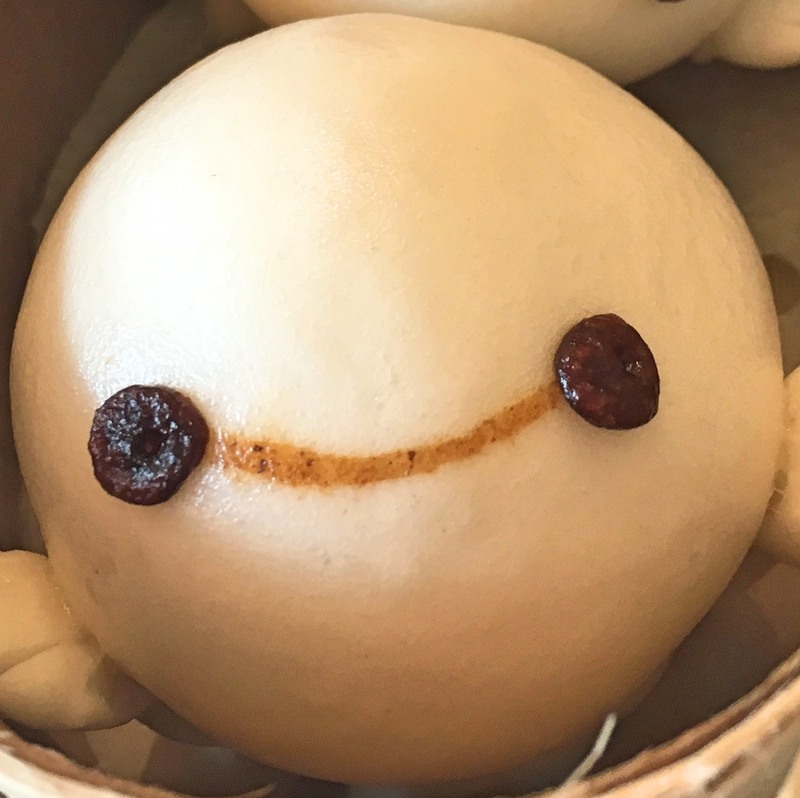 In one serving of a steamer basket came two dim sum pieces of Baymax. Something so simple as two hand rolled balls of white glutinous dim sum pieces looked so unique! Baymax may not have been one of the most well marketed Disney characters but to be honest with you, I absolutely love him! Decide on whether you want the Disney Special Dim Sum Lunch Menu or the other special menus that are available. Reservations are required and I suggest you book well in advance. Although there weren’t too many people there when we first arrived but when we were near to finished eating, the entire restaurant was completely filled. For the Disney Special Dim Sum Lunch Menu, one order of the set menu is for only one person. My pictures, and other pictures on the internet, you might see a few dim sum pieces combined in one steam basket but really it is only one dim sum piece per order/basket. We made the mistake of ordering 3 sets for 6 people because of the online photos but I suggest that if you are going with a party of 6 adults, then order 6 sets. The Dim Sum Lunch Menu is not cheap (I think it was about $40USD per order at the time we went). So if you are really hungry, be prepared to still buy some food after you finish your meal as the portions are rather small. This was more of a Disney-themed experience for us rather than a buffet. The staff did their best to accommodate for our needs considering their English was very limited. But if you find one person who speaks English better than anyone else, get their attention as much as possible. Even though it is not common to leave a tip in Hong Kong, or Disneyland for that matter, we still gave a tip. The staff worked hard for our smiles and we enjoyed the entire experience. Hope you enjoy your Hong Kong Disneyland dim sum experience like we did! Coming soon: This is just a preview of my dim sum experience at Hong Kong Disneyland. In the meantime, hope you all like my Quick Pic of Duffy The Disney Bear inside a dim sum steamer basket.